It is time to move away from a consumption-driven economy to a savings-nurturing society. Otherwise, we will prove that the only lesson we have learnt from the economic history of the plastic-addicted debt-ridden Western society is our refusal to learn any lessons at all, says R. Vaidyanathan. INDIA’S savings rate in the 1960s used to be around 8-10 per cent and the theory of the vicious cycle of poverty — low savings rate leading to low investment hence low income and back to low savings rate — was made popular, using India as an example. In a sense that theory, by Kuznets et al, suggested that countries such as India are doomed to failure due to low savings rate. From the 1980s, India’s savings rate has increased significantly; it was 20-24 per cent throughout the 1990s. Recent statistics suggest that it is of the order of 28 per cent of national income. Nearly 90 per cent of the national savings is due to household savings. Partnership and Proprietorship firms (P&P sector) are treated as household in our savings data. The savings rate in the developed economies, particularly in Europe and the US, has declined significantly in the last decade. Also, the household savings, as a percentage of household disposable income, has drastically fallen, setting alarm bells ringing among economists who used to argue for consumption-driven growth. Table 1 shows the household savings rate as a percentage of disposable household income for different developed countries as provided by OECD. The household savings have significantly declined in the case of most of the developed countries, particularly in the 1990s. It is negative (that is, they are dis-savers) for Australia and New Zealand and around one per cent in the US. This happened due to the consumption-driven economy propagated by the experts in the 1980s and the 1990s. It was felt that the consumption of households will create enough demand-pull which, in turn, could generate productive activities, and the important thing to monitor is the retail off take in departmental stores. Actually, monitoring retail sales is an obsession among economists in many Western countries. It became a credit card-driven economy and each household began to accumulate goods in their basements and, in the process, most middle-class American households have a large retail shop inside their home. The interest on loans was kept low, so that borrowing-led consumption can be accelerated. Of course, as India, China and many East Asian and Arab countries are financing the US economy by investing in their treasury bills for rates lower than three per cent and it became an economic axiom that US consumption is the key to global growth. The lack of savings by households impacts not only on the current situation but also the inter-temporal distribution of wealth. We can use a thumb rule that whenever the savings rate of a society is less than 10 per cent of its disposable income (with stable taxation and inflation), the society is getting into difficulties. Many households began to rely more on social security, and this liability, in some countries, is not, or is inadequately, funded. This, in turn, has created substantial issues of solvency of government and its ability to take care of the old-age security of its citizens. This, coupled with the declining population growth rate and longevity of current population, is creating an explosive situation of bankrupt state exchequer and lower accretion to the social security fund from blow. Consumption-driven society is turning to be a “Responsibility Denial” society. The consumers are feted and savers are frowned upon. But the wheel is slowly but surely turning. Suddenly, the good old virtues of saving and thrift are becoming the fashion from Alberta to Auckland. The limits to consumption-led growth are realised. On a global scale, the consumption-led growth of some countries such as the US are supported by saving countries in the developing world. But how long can these anomalies continue? There are debates and discussions about the “virtues of savings” in the Western media and among economists. The savings of the different sectors of the economy — government, private corporate sector and households — for the different decades starting with the 1950sare given in Table 2. The savings rate of the economy has doubled from the 1950s to the 1980s, from around 9 per cent to around 18 per cent and it has increased to around 24 per cent in 2000-2001. This phenomenal increase in savings has been achieved through the efforts of the household sector, which accounts for nearly 90 per cent of the national savings. This savings rate of the households is without considering investment in gold by households, since the Government economists consider that as consumption. Actually, purchase of gold is an insurance and pension product for the lower classes and if we include that, our savings rate will be higher by another 2 percentage points. In this context, Partnership and Proprietorship enterprises involved in business are also included as households. 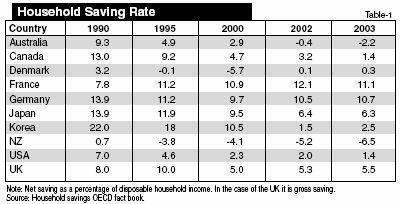 If we consider only the disposable income of households, the saving rate as a percentage of that will be more than 40. We are becoming a saving society, which is the main driver of the economy. Because of this, the dependence on FDI and FII is significantly lower. It is at this juncture, we find experts and corporates in India suggesting that the middle-class should consume more. Shopping is made a virtue and a lifestyle statement. The hidden persuaders (advertising) are in the open. Plastic credit cards are offered for the asking (many times without even asking!) and consuming is made the modern mantra. It is consume or perish which will slowly turn into consume and perish! The Government is discouraging savings by keeping many a rate low and removing tax breaks for saving. But the Indian middle-class needs saving much more than anyone else in the world. We do not have universal medical care and, hence, during old age the cost of healthcare has to be borne by the middle-class. We do not have universal social security. Of more than 400 million workforce in the country, only some 20 million government employees (Central plus State and local governments) and around 40 million private employees (who are covered by Employees Provident Fund — EPF — schemes) have retirement benefits. Large number of middle-class and poorer segments are not covered by any social security schemes. The age composition of the elderly, as estimated by the Census office, for different decades is given in Table 3. Nearly 7 per cent of the population is above 60 years of age. Table 4 shows population projections. It says that the population above 60 years is expected to be 7.5 per cent by 2006, reaching 9 per cent by 2016. This indicates that a substantial portion of elderly need to be taken care of. As per Census 2001, there were more than 403 million total workforce consisting of 311 million rural and 92 million urban workers. The social security coverage of most of the agricultural and non-industrial workers is inadequate. This is one area where the policy-planners and society need to focus rather than on consumerism. Their savings can only protect them. Western economics start with the premise that “Wants are unlimited and resources are limited”. Our civilisational ethos is based on “limited wants” in the context of conserving for the future and conserving the nature. It has cross sectional advantage of nurturing nature and inter-temporal benefit of taking care of elderly and planning for social security in old age. The greed-based market economy may not offer solutions to the problems of multitude if the focus is only on consumption-driven society. The fear-based totalitarian systems such as communism have also failed. It is necessary to evolve a third way which is environment-friendly and takes into account intergenerational equity not by the fiat of the State but by the suasion of social norms. Time to move away from consumption-driven economy to savings nurturing society. Otherwise, we will prove that the only lesson we learnt from the economic history of the plastic-addicted debt-ridden western society is our refusal to learn any lessons at all. ← NGOs: To whom are they accountable?